If you want to turn your digital photos into professional artworks, the best procedure is printing your digital photos on canvas. Printing digital photos on canvas is a major advancement in the printing industry. This procedure is unique in that it endows an original painting-like quality to the digital photos. 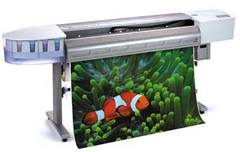 Superchrome, a large format digital printing company, has set a record in printing digital photos on canvas. You can have your digital photos printed onto canvas of any size with Superchrome. At Superchrome, we follow innovative digital printing processes to reproduce your photos on canvas. Utilizing the most advanced large format printers with ultrachrome inks and print head technology, we can make canvas prints directly from your digital photos. With our quick, efficient and cost effective scanning process, we reprint digital photos onto both heavy and light canvases, in either matte or semi-gloss finish. They are finished with superior coating and can be mounted onto a stretcher bar support framework, if you prefer. We can print your digital photos onto different canvas materials such as water-resistant canvas, glossy canvas, matte canvas and coated cotton canvas of heavy or light versions. All of these materials have features such as excellent color quality, image definition, fade-resistance, smudge-resistance, and water-resistance. We at Superchrome can support digital photos in a number of formats. We accept standard digital graphic industry formats like .JPG, .BMP, .PNG, .PDF, .PSD, .PCX, .EPS, .TIF, .TIFF and .TGA. We can transfer them in the same size or in any other size according to your canvas print needs. Our canvas prints look as similar as the original digital photo or image and feature water-resistance, UV resistance, maximum resolution and fine art quality finish. Our printing digital photo on canvas services enable you to preserve your favorite images for generations to come. If you want to convert your digital photos into canvas prints, you can send them on CDs to us. We will help you to convert them into incredible canvas art masterpieces. If you would like to know more about printing digital photo on canvas, any of the projects shown or if you want to discuss any project you have coming up then contact us 020 7237 9333 or fax 020 7237 9444 or email sales@superchrome.co.uk. Our experienced personnel would be able to guide you appropriately.